60 cardboard tiles (roughly 4cm square) featuring combinations of sections of road, city and field. 40 little wooden followers (8 blue, 8 yellow, 8 green, 8 red and 8 black). 4-page rule booklet + summary sheet. Gameplay: On their turn, each player takes a randomly selected tile and places it next to a tile that has already been played. They must do this in such a way that roads, city sections and fields join up. They then have the option of placing one of their followers on a feature. Players gain points on completion of a road or city that their followers control. Followers on completed features get returned to their owners to use again. Once all the tiles are placed, followers left on the board score points for the uncompleted features they control. Each completed city is also worth points to the player who has the most followers in fields ('farmers') with access to it. There are a few extra complications such as the cloister tiles which score one point for every tile surrounding them but, in general, the rules aren't too complicated once you've seen the game in action. The only mildly difficult bit is scoring the farmers at the end of the game. There's plenty of strategy involved in deciding where to play tiles, however. 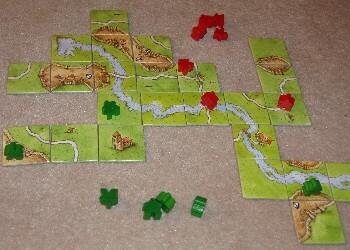 If the river tiles are used, they are all played at the start of the game, helping spread the game out a little. Object: To finish the game with the most points. Game length: Forty-five minutes to an hour. Age: Officially 8+. Children this age should be able to play unsupervised after they've had a couple of games to familiarise them with the rules. Younger children can join in but are unlikely to win without a little help and advice. Comments: This is an excellent introduction to strategy games. It only requires moments to set up, isn't too complicated and takes a fairly predictable amount of time. 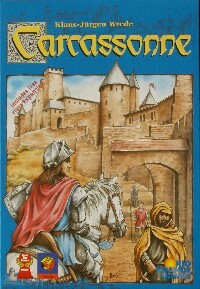 Although Carcassonne is competitive, it's not confrontational, so no one feels they're getting picked on and no one gets knocked out early. More than that, because a large proportion of the points aren't tallied until the game is finished, it always feels as if everyone is in with a chance right up until the end. Unlike games such as Risk, there isn't a lengthy period where the winner is pretty obvious but victory hasn't quite been achieved. The relatively small number of rules makes the game suitable for children but the random selection of tiles means every game is different, keeping the game fresh for adults. Since there's no reading, the game is accessible even to six-year-olds with a decent level of concentration and enough maths skill to add double-digit numbers together. Conclusion: If you want to get the kids playing strategy games, this is a great place to start. Plenty of strategy but involves enough luck to give younger players a chance. No two games are quite the same. Beats the heck out of playing Scrabble with an eight-year-old. 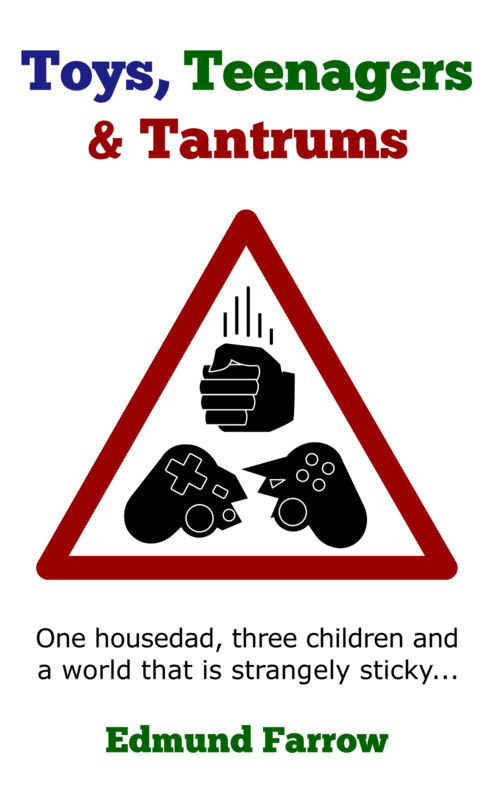 The scoring chart only goes up to fifty but scores of over a hundred are easily attainable in a two-player game. Not actually much in the box. There are about a dozen expansion sets available to soak up your cash. Difficult to move out of the way. It there's a half-finished game on the lounge carpet when you're doing the cleaning, you'll have to hoover round it.